I have read that melatonin shouldnt be something used on a regular basis so I switched to using 5-HTTP. Dr. Oz talked about this stuff too from what I heard. Theres a lot of research backing it up. I have used this 5-HTP 200 mg by NOW for many years and it really seems to help with promoting a positive mood and aiding with sleep. 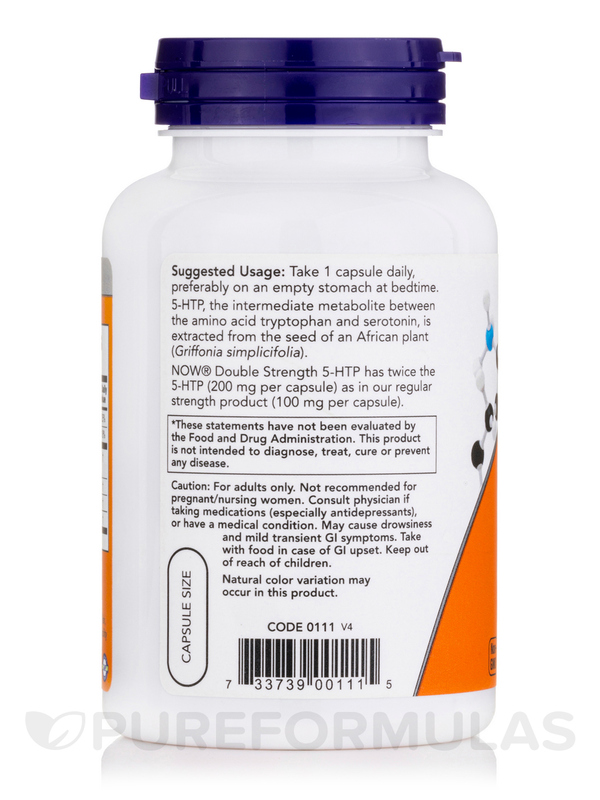 I started with taking 100 mg daily before bed and worked up to 200 mg.
NOW® Double Strength 5-HTP has twice the 5-HTP (200 mg per capsule) as in our regular strength product (100 mg per capsule). 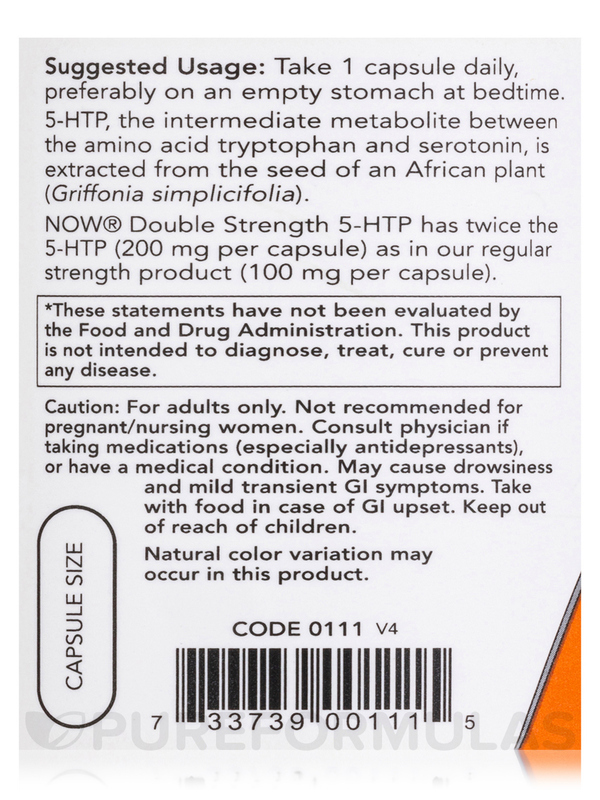 5-HTP‚ the intermediate metabolite between the amino acid L-tryptophan and serotonin‚ is extracted from the bean of an African plant (Griffonia simplicifolia). 5-HTP 200 mg (Double Strength) by NOW is a good option to try if you're feeling a bit down or depressed but you don't feel like going to the psychologist to get an SSRI prescription - SSRIs definitely have their problems. I haven't used it much, but I think it's good stuff. The price is high, but the same can be said for any other brand. 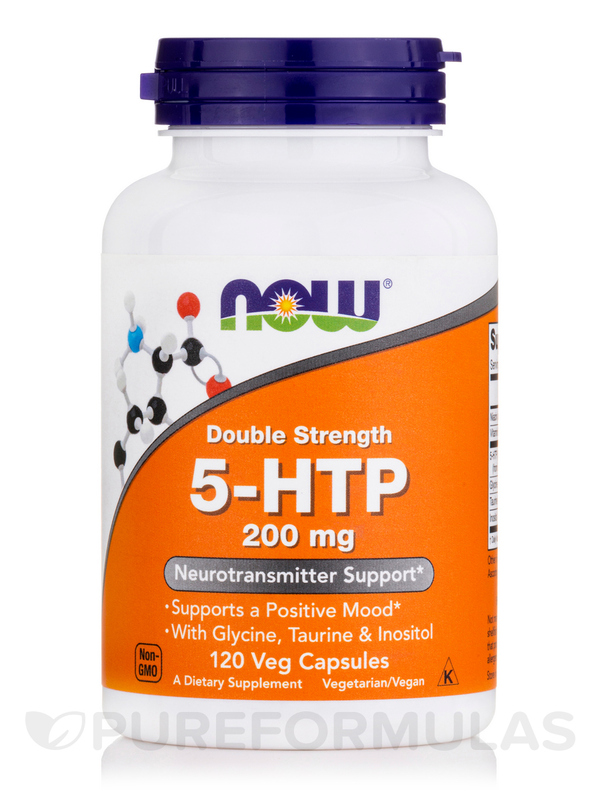 Purchased 5-HTP by NOW for neurotransmitter support to help with anxiety for mercury detox. Was using L-Tryptophane and was advised to switch because the 5-HTP was simpler for the body to use. I love the NOW products and prices. It appears to be working but I have and still need additional support with NOW Valerian Root. The combination of the two allows me to move on with life without the physically induced anxiety. At this point I am taking 200 mg. per day along with 1500 to 2000 mg. several times a day. Under Doctor's orders, I have been using 5-HTP by NOW Foods to help raise my spirits during some particularly stressful years of my life. I have used NOW Foods products in the past and have been very satisfied, so I decided to give this product a try. 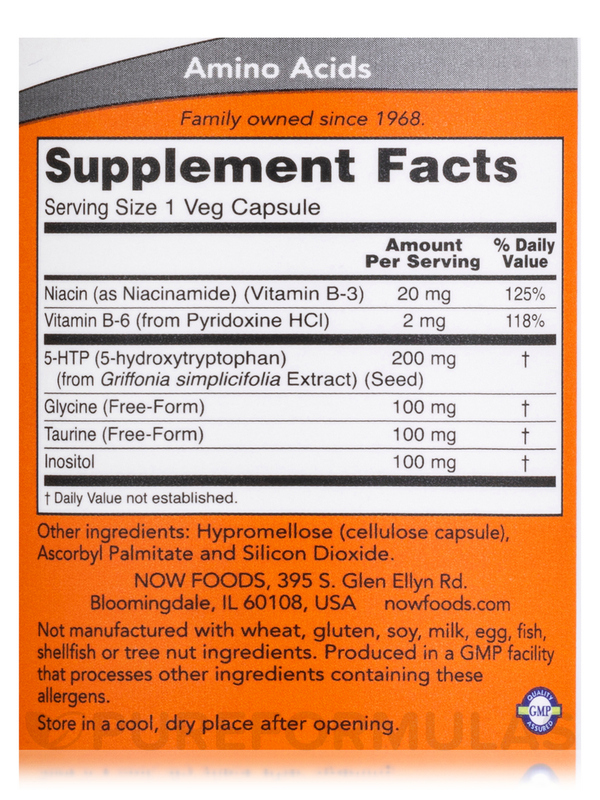 I am glad I found a 200 mg. vegetarian capsule for such a good price! It is a brand I trust and it is offered for a very good price! We have been using this product for about two years for my 11 yo with ASD. I give the 200mg version at bed. Since we started using this product my son has consistently slept through the night for the first time since birth! It also appears to lengthen his sleep duration by about 1 hour. We started at 50mg and then titrated gradually to 200mg. He has been on melatonin since age 2 however this only appears to help him to fall asleep rather than to maintain sleep (past the initial 4-6 hours past going to sleep). 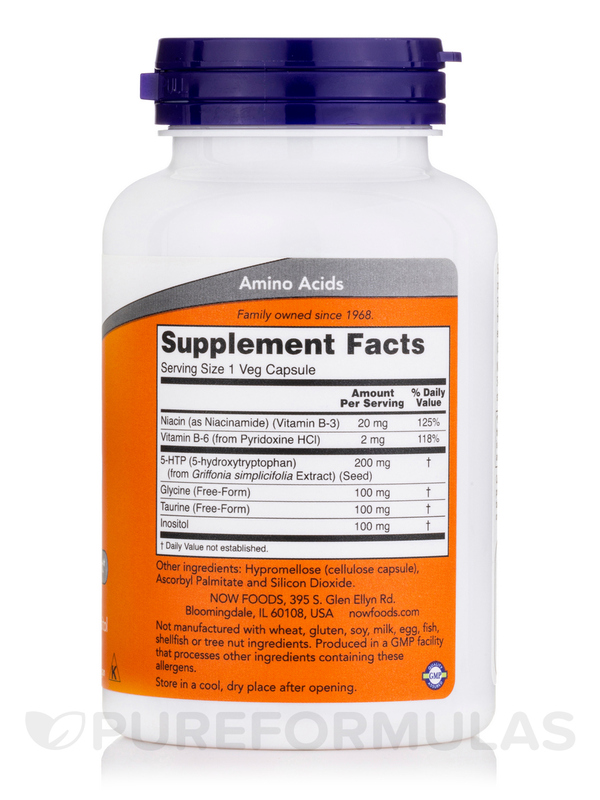 We started using the 50mg version for daytime about 6 months ago. It does appear to lessen his daytime anxiety. 5-HTP was recommended to me by my naturopath doctor - love it!